What to be for a day this year... Shall I be spooky, funny, wierd, important, historically significant? Rock Art: Get some old clothes, dye them terra cotta, and paint symbols, animals, and kokopelli all over them as if you were one of the "ones that came before". Kokopelli: We've all seen various versions of this fertility spirit. Use your imagination, it could be a real conversation starter. A Polygamist: Pin several barbie dolls to your jacket. Of course, this would only work for a guy. Brigham Young: Wear old-timey clothes and get a	really bad hair cut . Pin several barbie dolls to your jacket(see "Polygamist" above), carry a Book of Mormon , and say often "This is the Place". Pioneer: Dress up in old-west type clothing including hat or bonnet and lace-up boots. Push a shopping cart filled with camping gear around all evening. Bee or Beehive: This could be a fun group costume. Most would wear bee costumes (black clothing with horizontal stripes of yellow tape, attach "antenae" made of pipe cleaners to a black ski hat, make wings out of cardboard and tin foil). One person would be the queen (same costume, but she is stuffed to look bigger, and she wears a tiara). And one person dresses as a hive (cardboard box with black circles drawn on to look like the holes. Also draw on several small bees). A Family Tree: Utahn's love to trace family histories--just look at all the genealogy resources we have here. Make a tree and hang various branches off of yourself to show your family line. You could show Adam and Eve, or God (or someone else famous, and brag that you are related) at the top of the tree. Great Salt Lake: Wear gray. Pin little power boats and sailboats to your clothing. Carry a pink flamingo. Spray yourself with perfume scented with brine shrimp. Red Rock: Just wear a terra cotta colored sweat suit (or dye and wrap a sheet around you), maybe get a few toy bikes and pin them to you so you look like the slickrock trail. A Geode: We love to go a'huntin' for these things out in the west desert. How about commissioning a sewing-talented friend into making you a simple jacket or wrap that is gray on the outside and has a brightly-colored and shiny fabric on the inside. Carry your own hammer. 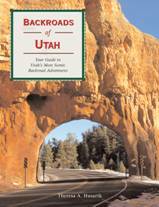 Coal: No, not to show what you deserve for Christmas, but to honor	Utah's state rock. Wear all black, shiny if possible. Copper Penny: Our state mineral is copper. Make 2 cardboard disks and spray paint them a sparkly copper color. Draw the face of your favorite Utah celebrity on the front and Kennecott copper mine on the back. Attach lengths of cording so you can wear it like one of those advertising sandwich boards. A Rocky Mountain Elk: The state animal would be a fine costume. Wear all brown and find a scarf of a darker brown. Make (maybe out of pipe cleaners?) or scrounge the costume stores for a set of antlers, or find one of those caps that have antlers on top. A Dinosaur: Utah is rich in relics of the prehistoric past, and we even have our own dinosaur--the Utahraptor. This one should be easy to find props for as dinosaurs are popular not just to Utahns. Trout: Utah's favorite fish to catch and release, as well as the state fish. Wear shiny fabric and paint vertical stripes of red, yellow and silver. Make a fin out of cardboard. Carry a fly fishing pole. Seagull: Wear white. Make wings out of cardboard. Squeal frequently. Glue some Mormon crickets to your feet (you've stomped on them) and face (you are eating them). Mormon Cricket: Wear a reddish color. Attach long legs and antenae. Bring about a thousand of your friends dressed the same and descend upon the party. The Tree of Life: You know that bizarre sculpture in the west desert. Affix some spherical objects to yourself, fashion a hat with another big sphere and pretend you know what ART is all about. Map of Utah: Take a sheet and draw an outline of Utah. Fill in some landmarks and roads. Draw a big red arrow pointing to Salt Lake City (or wherever you will be wearing it) that says "You are Here". Morton's Salt Shaker: Make a round cardboard tube large enough to wear. Paint it blue and write "Morton's Salt". Carry a full shaker and sprinkle people. St. Provo Girl: The shockingly scantily dressed, voluptuous girl that is the mascot for one of Wasatch Brewery's products. See who laughs and who gets annoyed. A Cowboy: You might even already have everything you need right in your closet (or you most likely know someone who does). Cowboy boots, cowboy shirt, chaps, spurs and of course, a hat. A Mountain Biker: Fashion a toy bike out of something light-weight, like art wire, pipe cleaners, or even paper mache, and attach to the back of your shirt. Wear spandex, and a helmet, splash yourself with mud, add a little fake blood. A Handcrafter: Utahn's are know for their wonderful talents in crafts. Carry a basket full of supplies for your favorite craft-- quilting, scrapbooking, cutesy decoration-making, etc. A Jazz Player: This is an easy one, with so many stores carrying sports memorabilia. Get a Jazz jersey, some big sneakers, and carry a basketball. Rocky Anderson: I'm sure there will be masks available. Pick your favorite hairstyle from the ones he has sported in the last years. Carry some Olympics memorabilia and a "Main Street" street sign. Be sure not to drive 5 miles over the limit. Grumpy Old Man: Not necessarily unique to Utah, but it is my husband's favorite. No costume or effort required. Just be yourself.